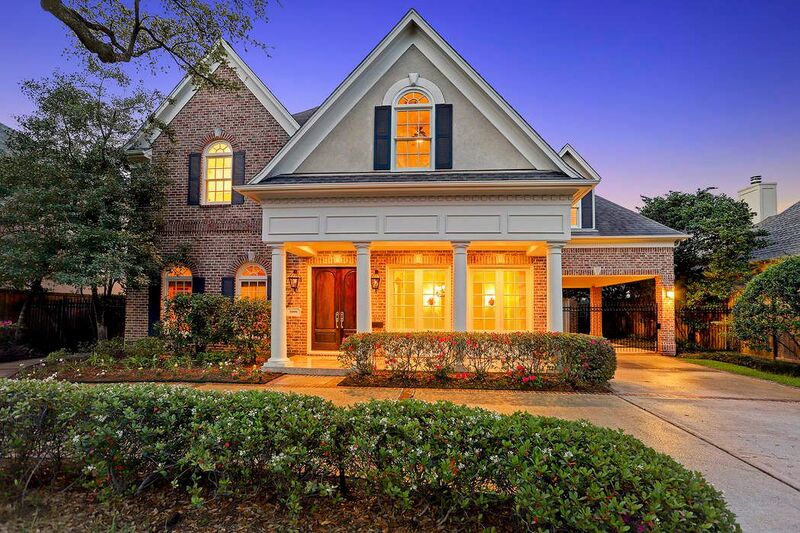 5090 Cedar Creek Drive, Houston, TX 77056 | Martha Turner Sotheby's International Realty, Inc.
5090 Cedar Creek - Designed by Robert Dame & built by Chris Sims, this urban retreat in the Tanglewood area is convenient to area restaurants, shopping and entertainment. Backyard Patio Area - Relaxing area with plenty of space for family and friends. 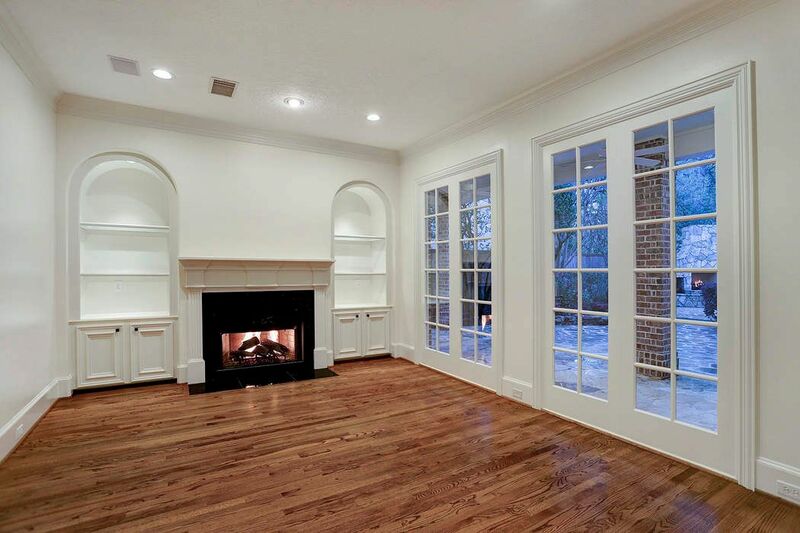 Stone fireplace and hearth provides ample seating for entertaining. Lush landscaping can be viewed from many rooms. 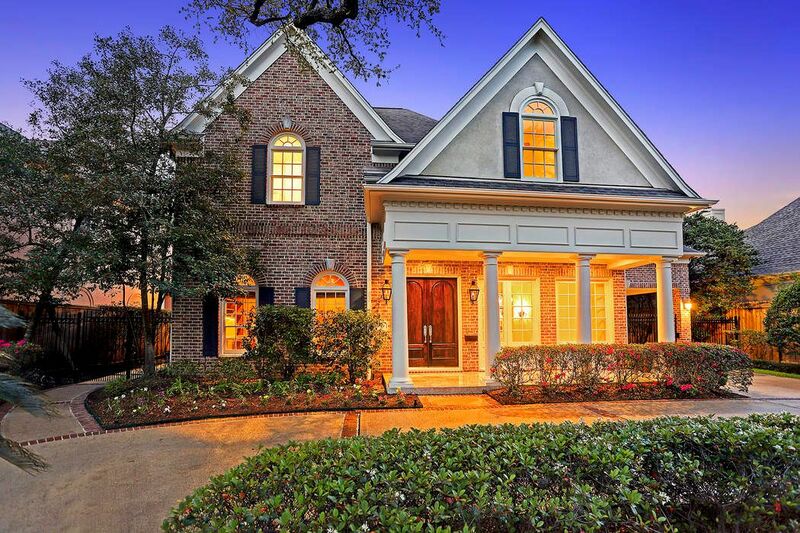 This Beautiful Traditional home built by Chris Sims is located in the Tanglewood area. Plenty of parking for guests with the circular driveway and the gated, porte cochere. 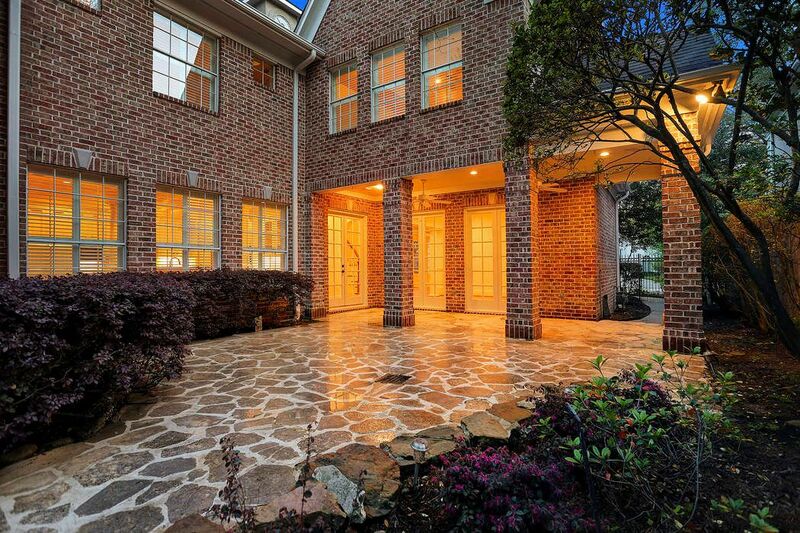 Lush landscaping, circular drive and gated porte cochere are a few of the amenities this beautiful home offers. 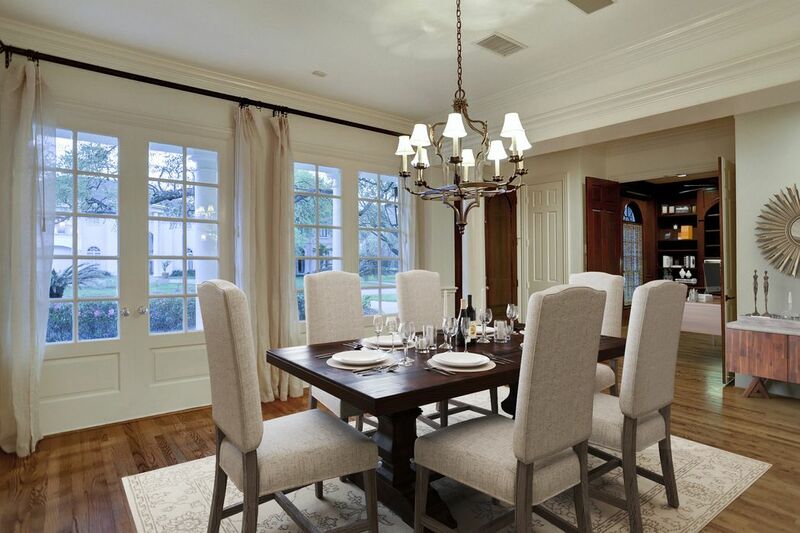 Dining Room (18x13) virtually placed furniture to assist with visualization and furniture placement. Study (14x12) virtually placed furniture to assist with visualization and furniture placement. 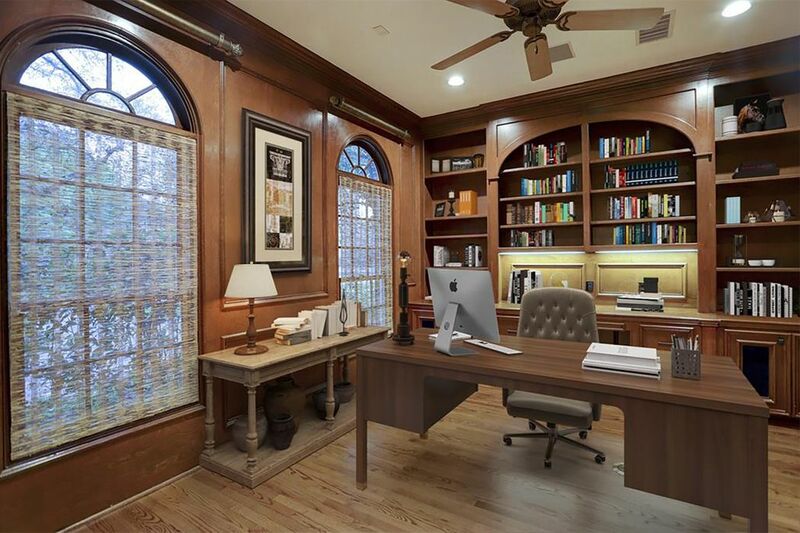 Study (14x12) Offers French door entry, oak flooring, wood paneling, built-in desk with under cabinet lighting, built-in speakers, cigar exhaust fan, recessed lighting and ceiling fan. Formal Living Room (18x14) virtually placed furniture to assist with visualization and furniture placement. 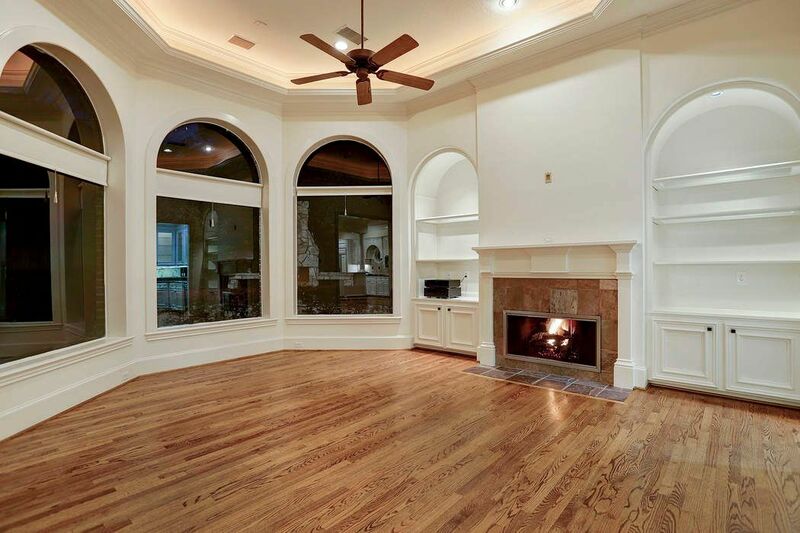 Formal Living Room (18x14) Offers oak flooring, 10' ceiling, built-in speakers, fixed French doors, gas-log fireplace with marble surround, recessed lighting, built-ins with art lighting and double crown molding. Formal Living Room (18x14) Views of the covered Back Patio and Backyard. Access to the grand staircase and powder room. Kitchen (18x15) Features a wall of windows with wooden plantation shutters. 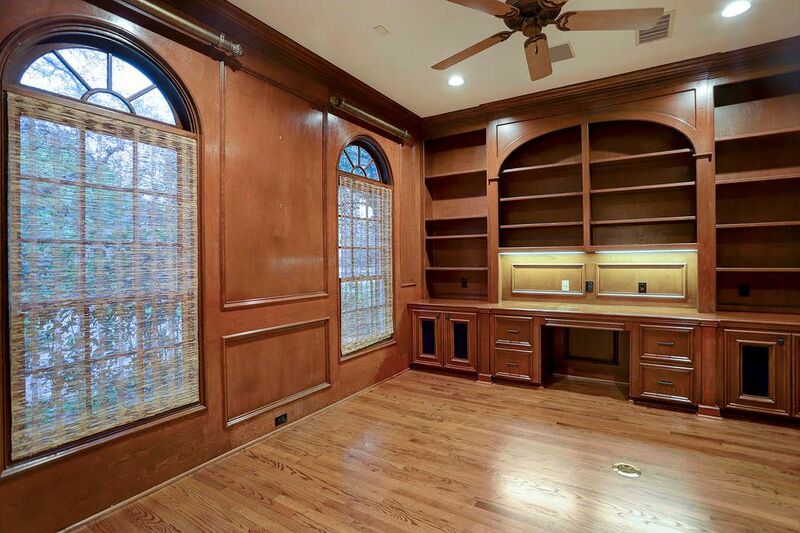 Has access to Butler's Pantry, Garage, Back Staircase and Den. 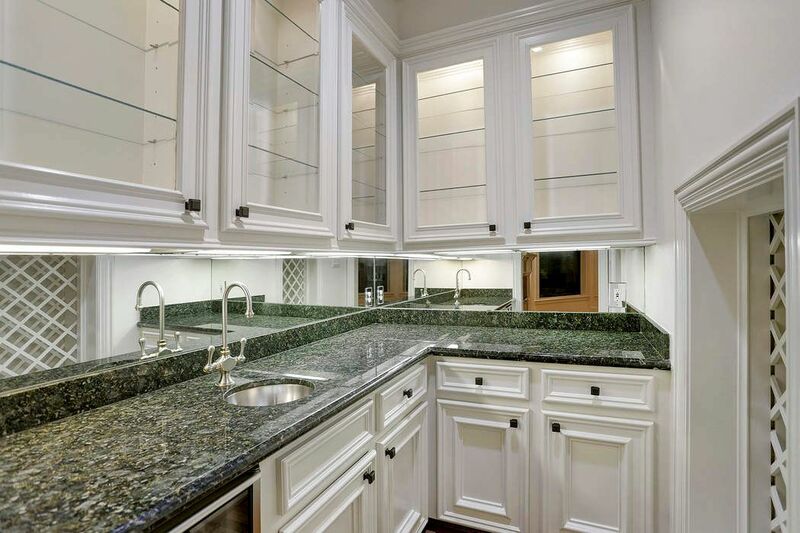 Butler's Pantry has granite counter tops, custom cabinetry with glass panel inserts, recessed lighting, oak flooring, double crown molding, under stair storage and broom closet. 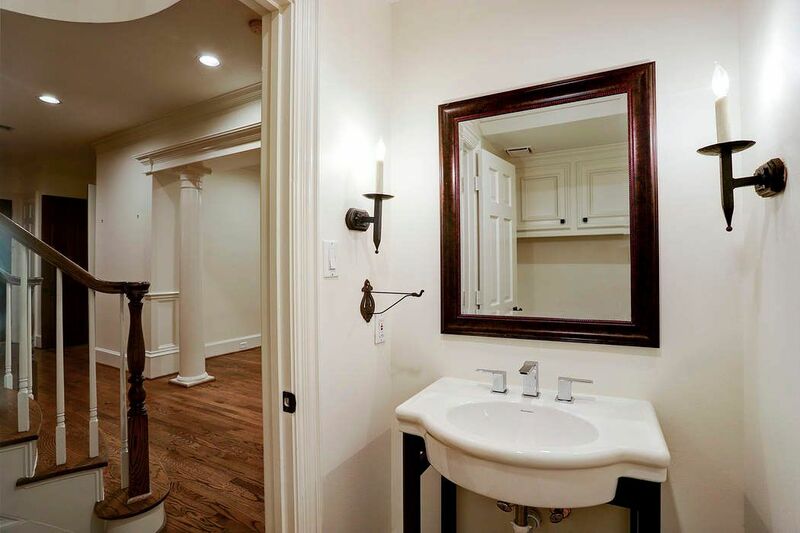 Powder Room located on the first floor across from the Formal Living Room. Den (16x15) virtually placed furniture to assist with visualization and furniture placement. 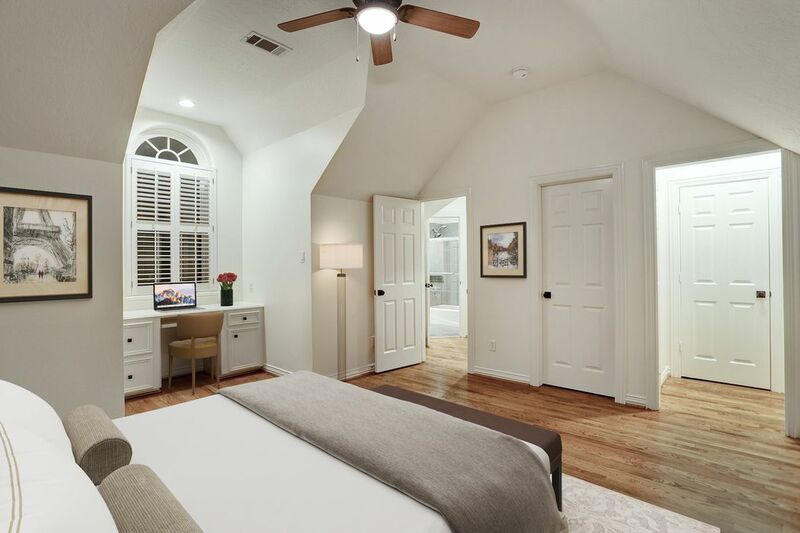 Owner's Bedroom with virtually staged furniture to assist you with furniture placement. 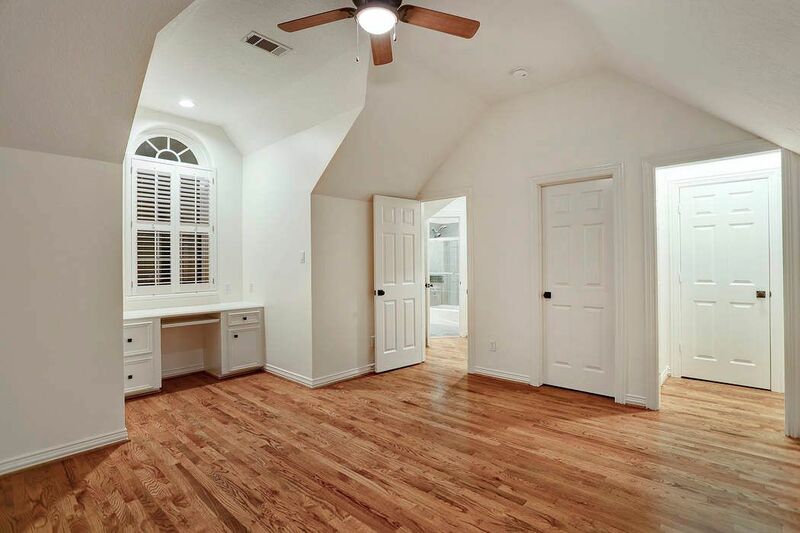 Owner's Bedroom (18x16) with oak flooring, 7' door, ceiling fan, 12' coffered ceiling, wooden plantation shutters, double crown molding and built-in speakers. Secondary Bedroom with virtually placed furniture to assist with furniture placement and visualization. 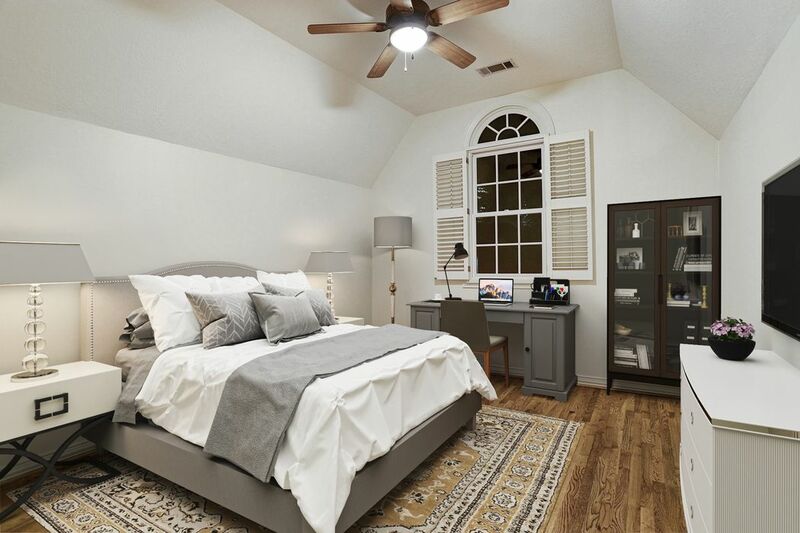 Secondary Bedroom has 12' ceilings, built-in desk, wooden plantation shutters, ceiling fan, recessed lighting, two closets, oak flooring and access to Hollywood bath with private vanity. Secondary Bedroom with virtually placed furniture to assist with furniture placement. 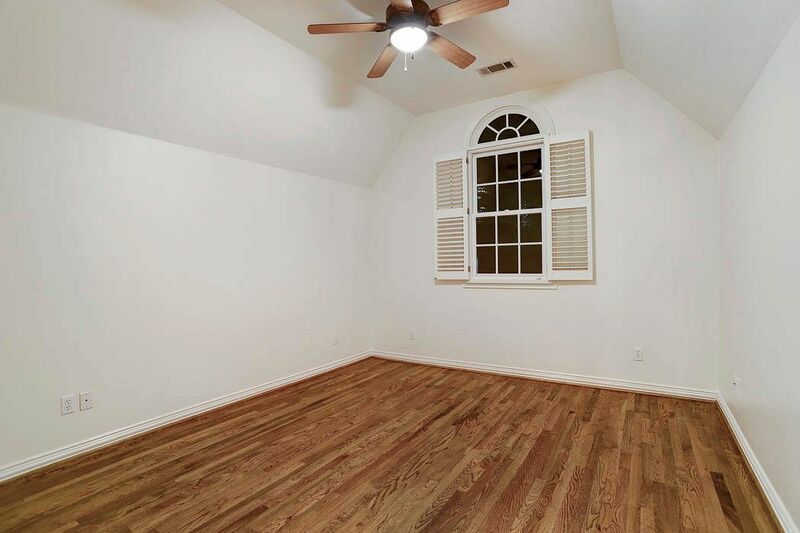 Secondary Bedroom with oak flooring, ceiling fan, 12' ceilings, wooden plantation shutters and walk-in closet. 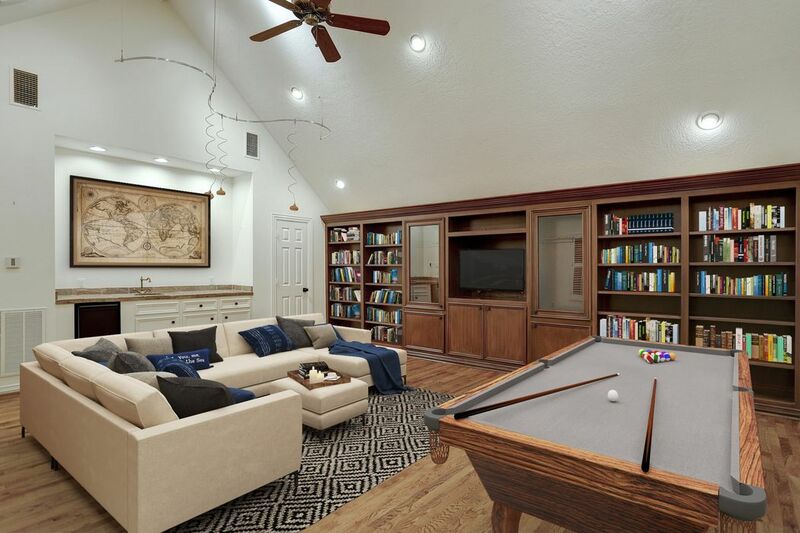 Gameroom with virtually placed furniture to assist with furniture placement and visualization. 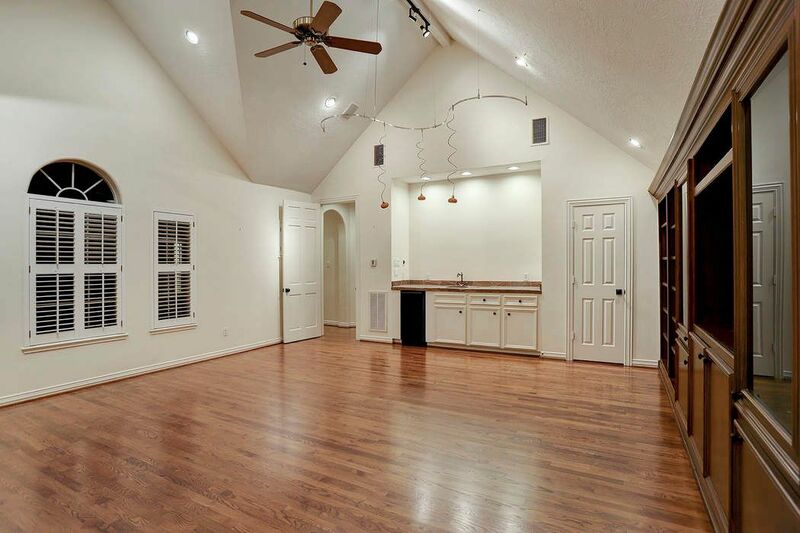 Game Room (20x18) has oak flooring, 15' vaulted ceiling, wooden plantation shutters, ceiling fan, recessed lighting, wet bar with natural stone counter tops, hammered brass sink and fixture with a U-line refrigerator and a half bath. 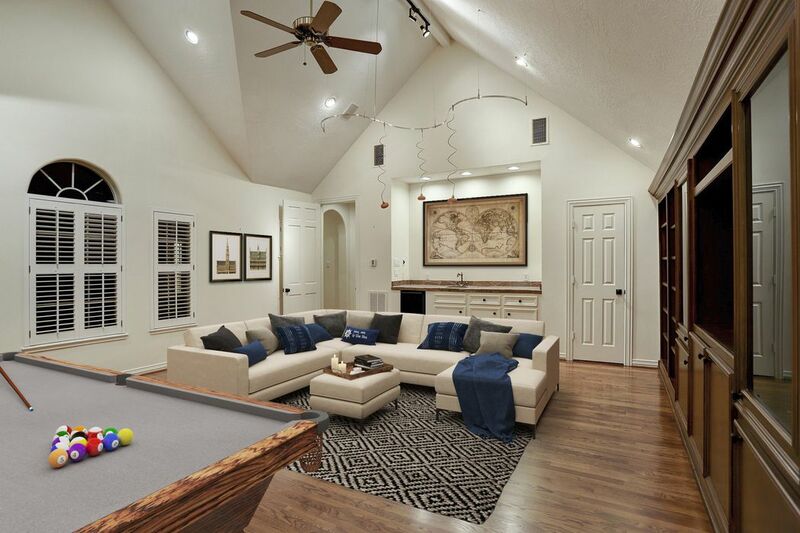 Gameroom (20x18) virtually placed furniture to assist with furniture placement and visualization. 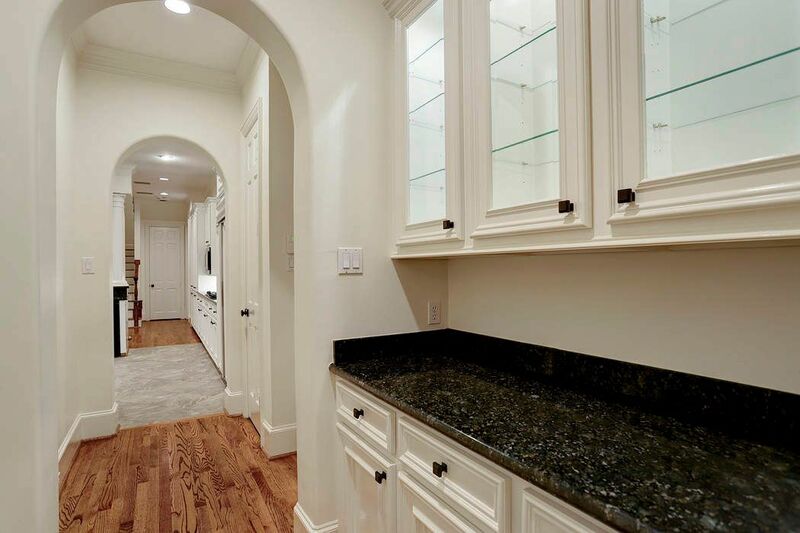 Game Room (20x18) also has a wall of custom shelves and cabinets with glass inserts and a half bath. Fabulous outdoor fireplace with two hoppers, perfect for entertaining guests. 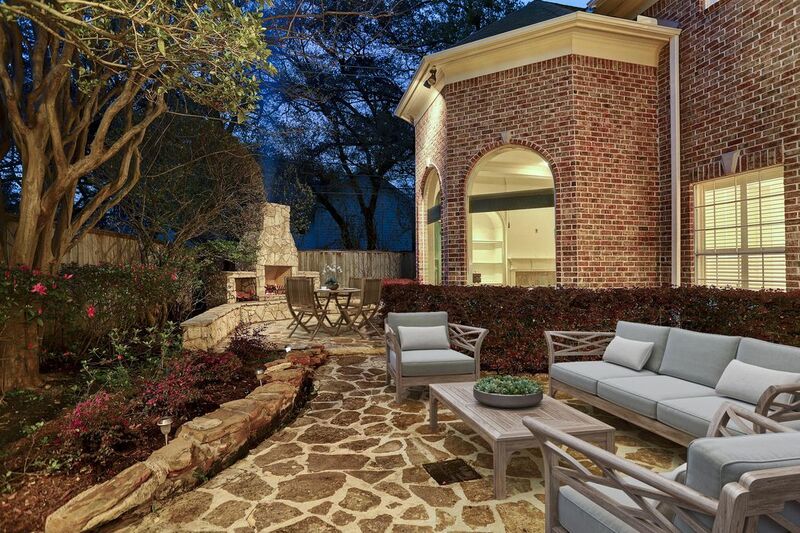 Beautiful outdoor space for relaxing or entertaining. Wonderful views from inside this home to the garden areas. 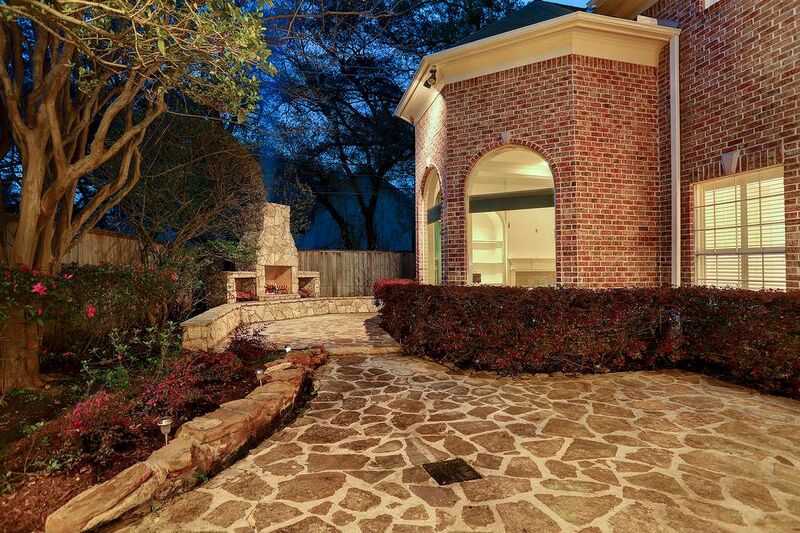 Backyard has flagstone flooring with covered back porch with ceiling fans and recessed lighting. 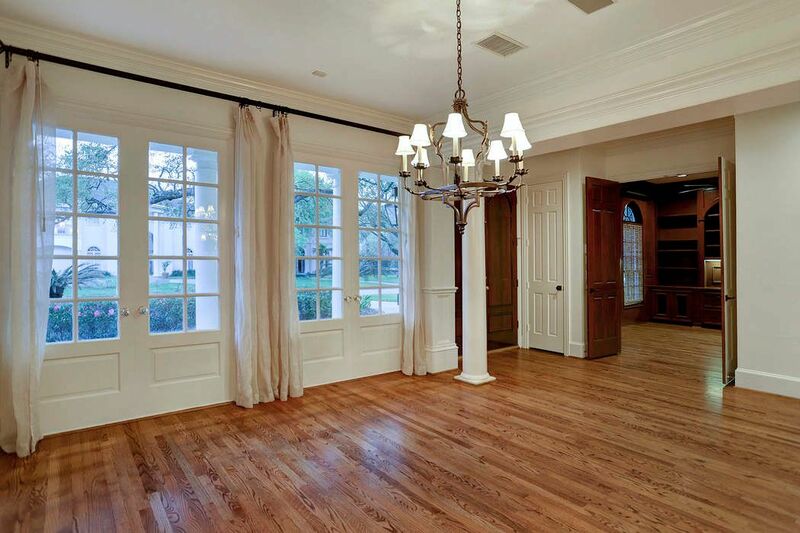 Wonderful space for relaxing or entertaining. 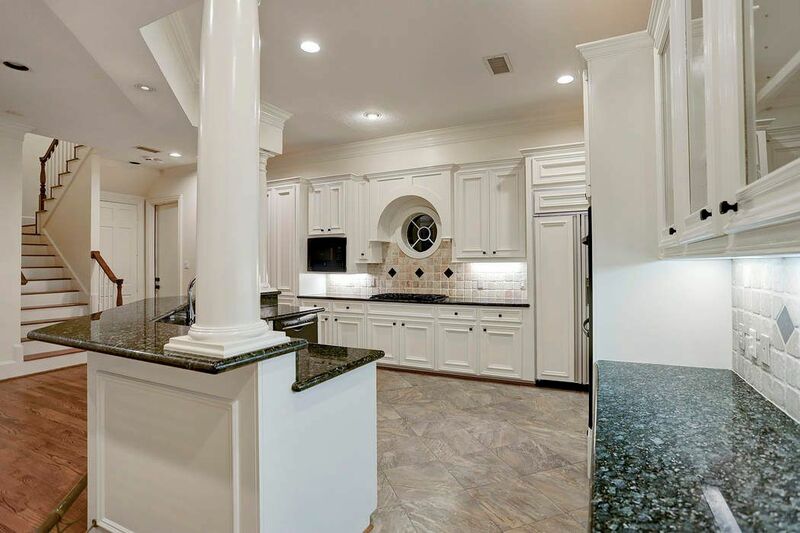 $1,500,000 4 Bedrooms3 Full / 2 Partial Baths4,657 sq. 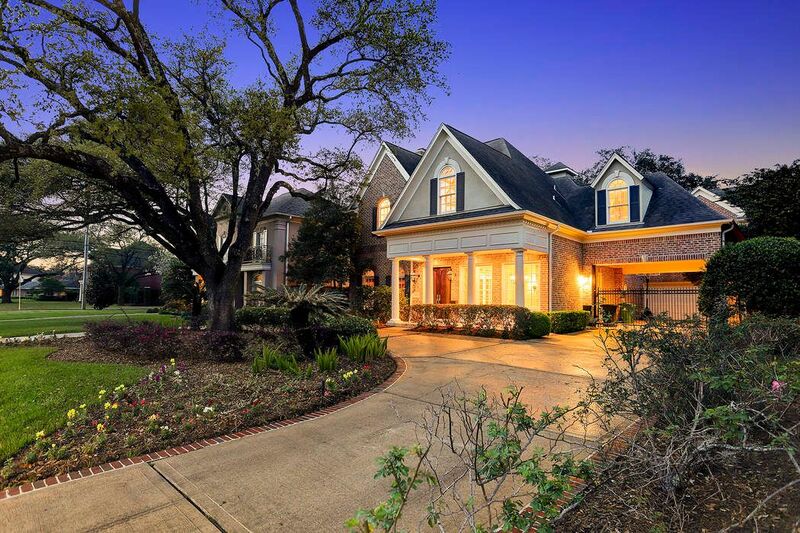 ft.
An elegant well-kept custom colonial home by Christopher Sims and Robert Dame, located in the Tanglewood area provides superior city living. 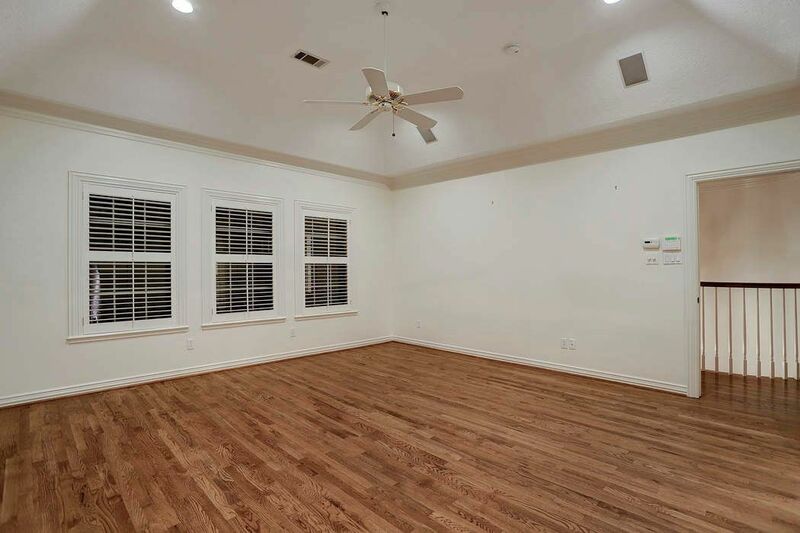 The home was recently updated and is move-in ready. Upon your arrival you’ll reflect back to the beautiful neighborhood and buildings you passed to get there. 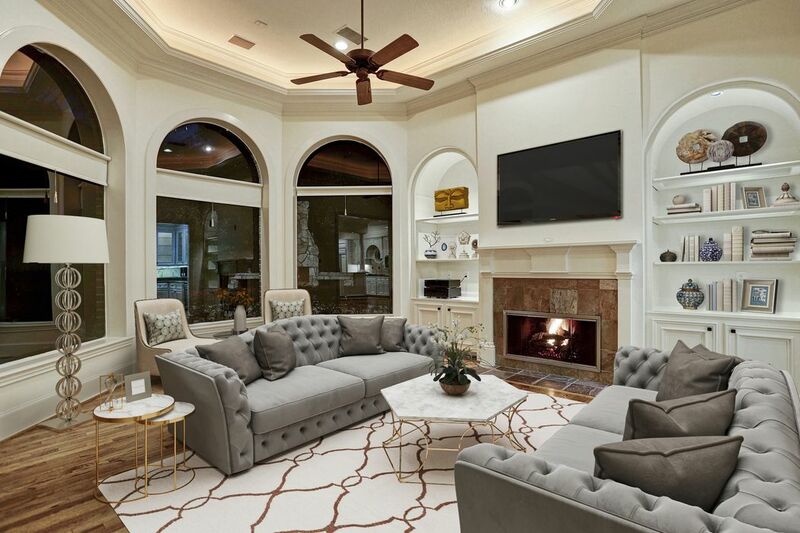 The circle drive makes guest parking a breeze and the gated driveway with porte-cochere provides convenient and secure loading and unloading of the owners vehicles. 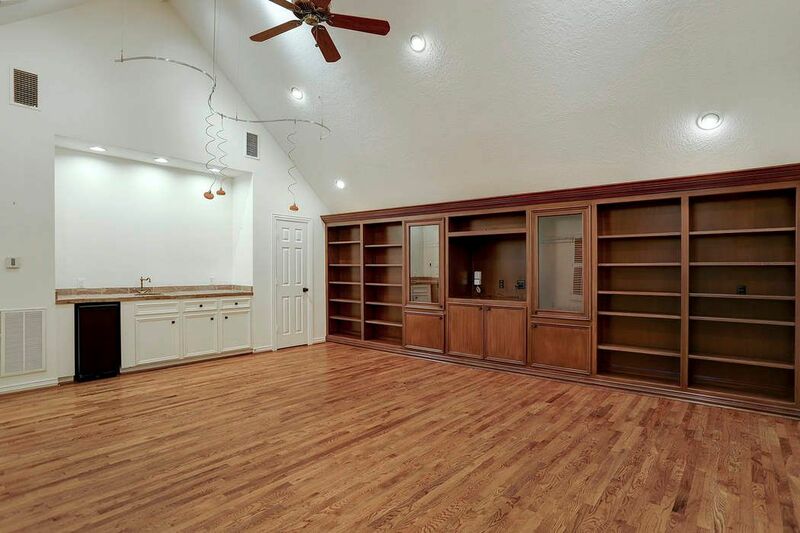 An oversized garage fits large SUVs, includes built-in cabinetry, a work bench and an oversized storage closet. 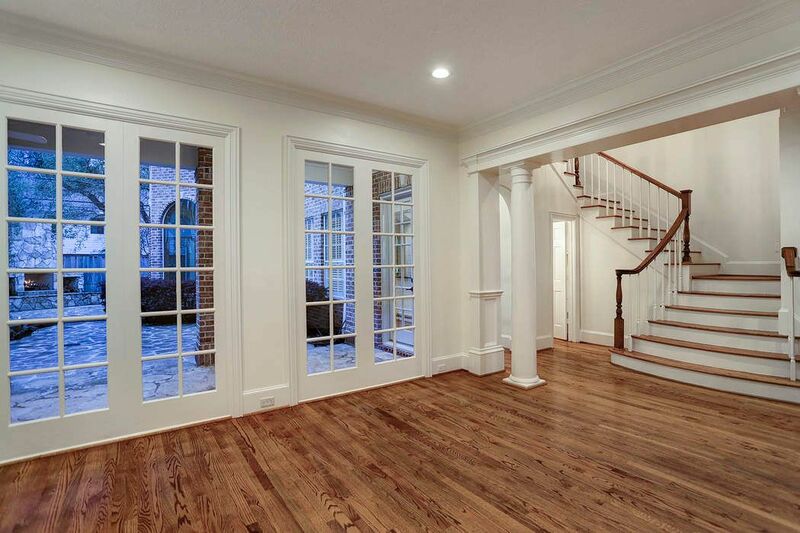 Approaching the home, guests are greeted with a regal front porch accented by limestone flooring, colonial-style pillars, mahogany French doors with Baldwin hardware and Bevolo gas lanterns. 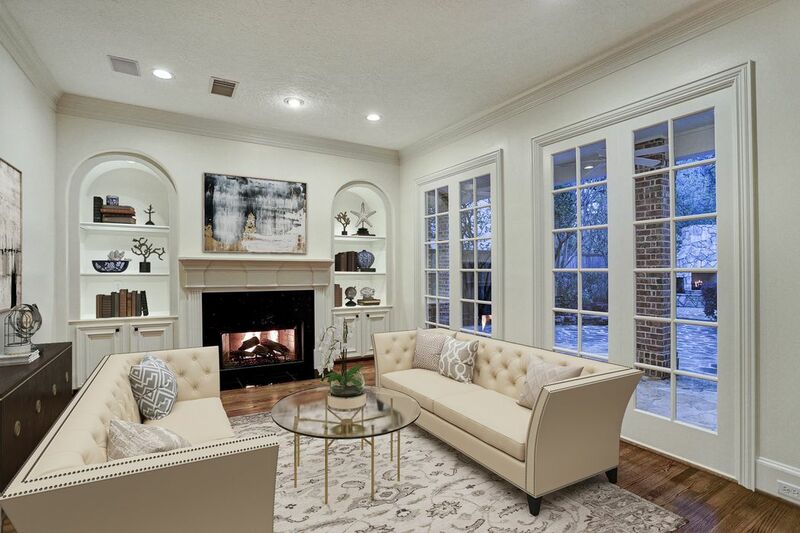 Once inside the wood paneled study (with cigar fan), formal living room with fireplace, high ceilings, oak floors and built-in speakers in almost every room will delight guests and take your entertaining to the next level. 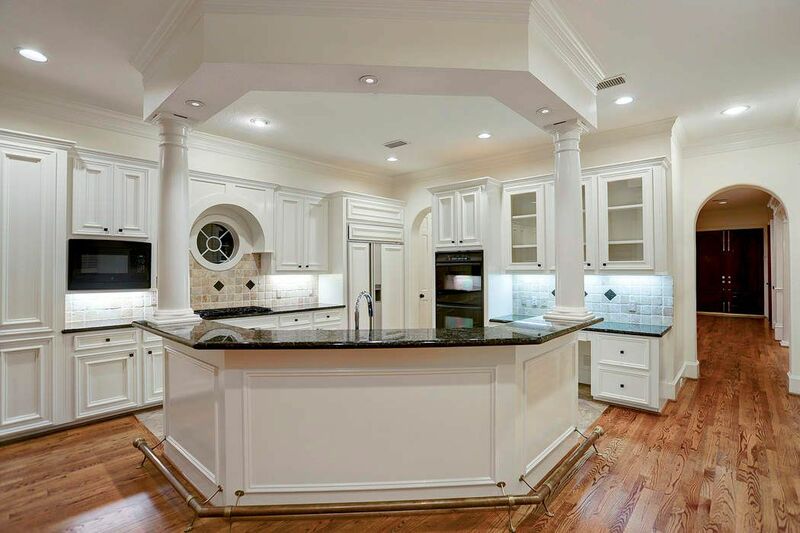 This home’s kitchen has double ovens, a breakfast bar and abundant storage. 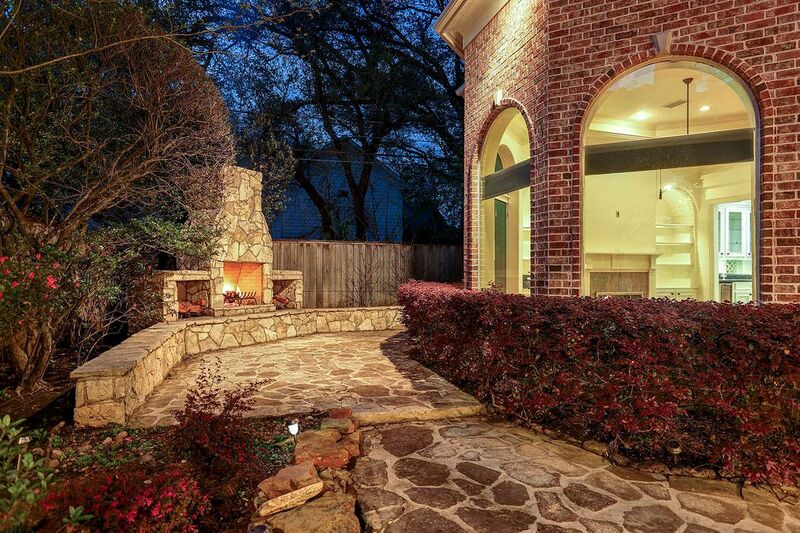 The stone patio offers a covered area with ceiling fans for warmer days as well as a fireplace with hoppers to conveniently store firewood for the cooler months. 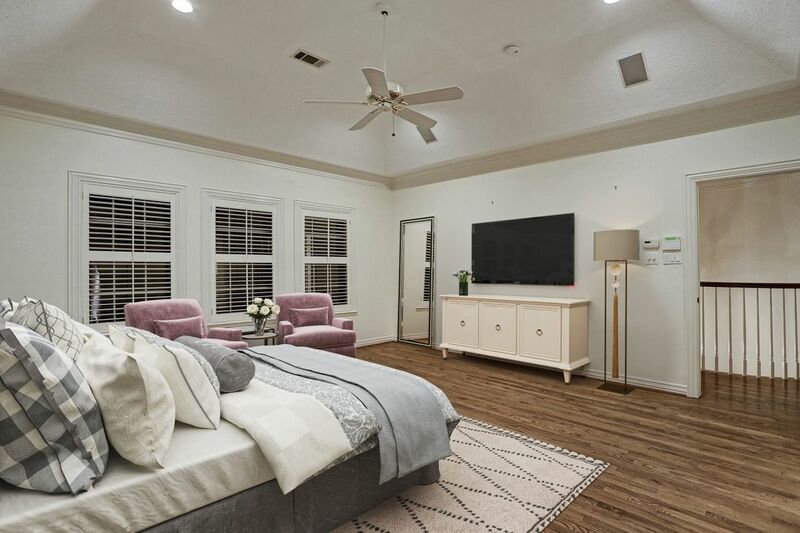 All bedrooms are located upstairs with a spacious master suite that boasts luxury finishes and features, a game room with built-ins, wet bar and half bath. Quick access to the Galleria, 610, Memorial Drive, I-10 and 59.